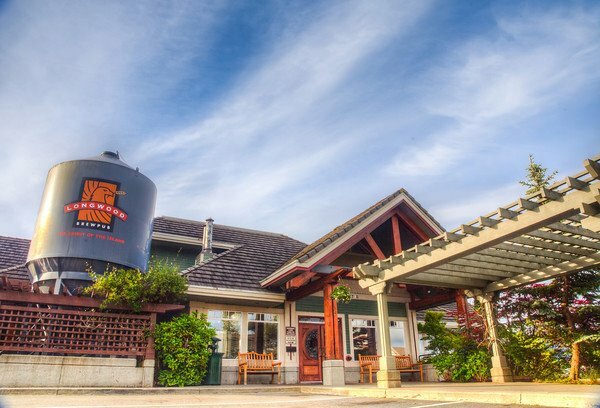 Ever since my wife and I landed in Powell River as part of our summer trip last year, hiking the Sunshine Coast Trail, we were surprised and impressed to find a craft brewing operation in the heart of town that catered to the Sunshine Coast. Not only were they well-situated as an operation, they seemed to know what they were doing when it came to producing quality beers. I can still remember sampling their Pale Ale, Blonde Ale, Porter, and the summer seasonal, a Blackberry Wheat that honored the city’s annual Blackberry Festival. Unfortunately, I lamented the fact that, at the time, their products were not available on Vancouver Island. 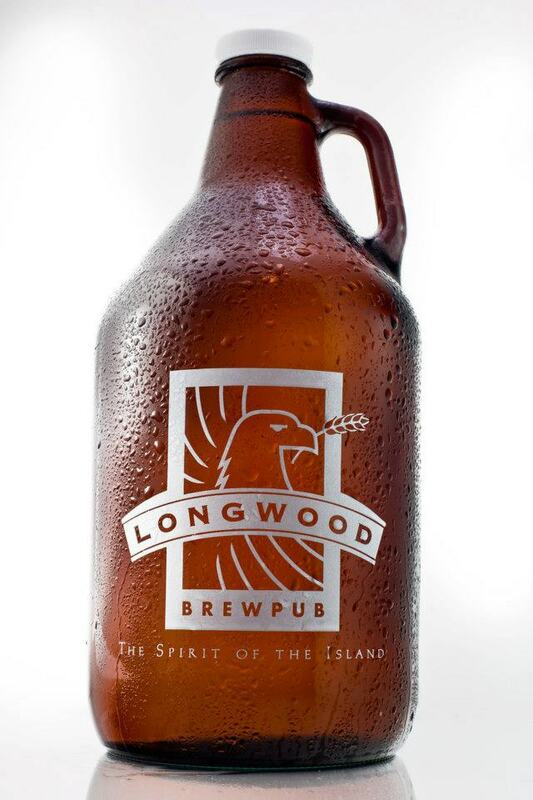 With the exception of Comox, which is a short ferry ride away, not a single beer store on the island was known to carry their lineup. Sure, you could find it up and down the Sunshine Coast, in Vancouver, and even parts of Washington State. But not in Victoria or the Southern Island, no sir! A special release from the Townsite Brewery, this beer has a rather interesting origin story. Apparently, the beer is part of a commitment on behalf of BC brewers to produce beer in honor of various Canadian bands. 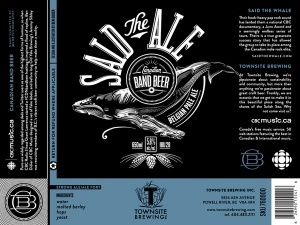 In this case, the Townsite brewery made this beer in honor of Said The Whale, a Canadian indie rock group that has was recently featured on CBC radio. As a Belgian Pale Ale, this beer combines aspects of the most famous variety of beer to be brewed in the Pacific Northwest and is fermented using a specific strain of Belgian yeast. The result is an interesting brew that boasts a yeasty nose and flavor with the rich malts and sharp, hoppy taste of a pale ale. In keeping with the recent trend of Belgian IPAs, this Belgian Pale Ale is quite refreshing and balanced in terms of flavor and quite appealing to the palate. 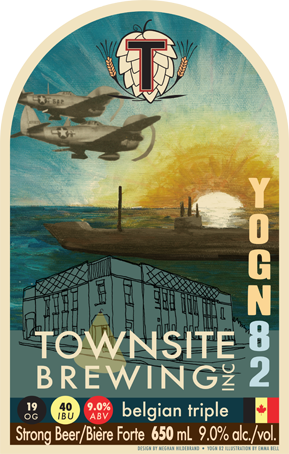 Brewed in honor of Cedric, the Townsite Brewer Engineer who hails from Belgium, and “the Hulks” – the concrete ships that make up the town’s breakwater – the YOGN 82 is the brewery’s latest triple-fermented Belgian-style beer. The second in the series, after last year’s Charleston Triple, this beer weighs in at a hefty 9% alc/vol and has all the characteristics a Belgian Tripel is famous for. This includes a golden blonde hue, a distinct yeasty nose, strong alcohol content, strong malts, and a distinct oaky flavor. And like each Hulk beer, it features a label created by a Powell River artist; this year’s featuring the art of Emma Bell. Overall, I was strongly reminded of La Fin Du Monde, another famous Belgian-style Tripel which also possesses some serious Belgian-yeast flavor, strong malts and an oaky undertone. The difference here is in the level of fruit flavor and sweetness, in that this one possesses a good deal more of it. In addition to some serious sugars, there was also a strong hint of banana that played well with the strong alcohol content, oak and yeastiness of the beer. Might seem a little overpowering to some, but I enjoyed it very much. In fact, it might just be the best Belgian Tripel I have had in recent memory! In short, not a bad set of additions to their overall lineup. I’m pretty pleased that the brewery is available here in my corner of the world, especially since I learned that they were turning out seasonal and special releases that I had no access to! It’s not like I can pop over to Vancouver every time they release a new beer, you know! Not that long ago, I discovered a that one of my local purveyors of beer just happened to stock a special German import. What made it special was the fact that this particular beer came from what is recognized as the oldest brewery in the world. 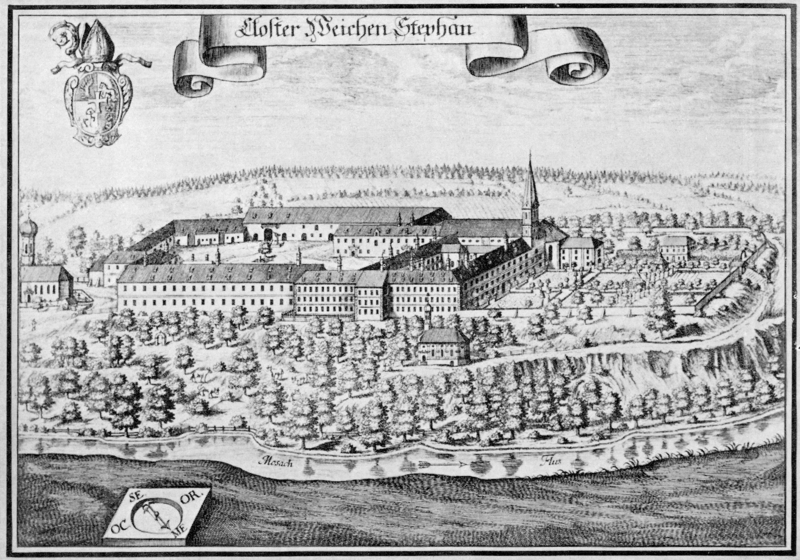 For those who don’t know, that would be the Weihenstephan Abbey located in Freisberg, Germany. Established by Benedictine Monks in 768 and licensed to brew beer in 1040, it is officially recognized as the world’s longest continually-operating brewery. Well it just so happens that my local beer store, the same place that offered their dark wheat (hefeweisenbier dunkel) has since expanded their inventory and brought in another label from this venerable operation. This time around, it was their flagship wheat beer, the hefeweissbier (or regular wheat) that caught my eye. Much like their dunkel, it is a refreshing wheat beer that is very yeasty in terms of taste and smell. But unlike the dunkel, it pours a golden straw hue, is light on the palate, possesses light notes of fruit and spice, and finishes very clean. This is to be expected from a standard hefeweizen, which do not boast highly roasted malts or particularly smoky flavors. And given the meal I paired it with, I’d say it’s a top contender for my “Beer That Tames The Fire” list – aka. beer that goes really good with spicy fare! And in addition to its appearance and flavor, it’s also comparatively light on alcohol, weighing in at an even and balanced 5.4% alc/vol. As a self-professed beer snob, it’s always a pleasure when I’m able to find obscure and venerated brews at my local liquor store. It’s also a pleasure when said brews extend my overall repertoire of Belgian beers. As the country that boasts more breweries per square kilometer than any other in the world, and the home of Trappist and countless other brewing traditions, they seem to be able to do little wrong. So it was with some anticipation that I managed to procure and tilt a bottle of Mc Chouffe’s Ardennes Brune. A relatively new operations by Belgian standards, the La Chouffe operation is nonetheless pretty renowned, producing a series of traditional, unfiltered ales that are refermented in the bottle. The Mc Chouffe is the dark ale of their lineup, boasting fruitier, more sugary malts, and weighing in at a respectable 8% alc/vol. 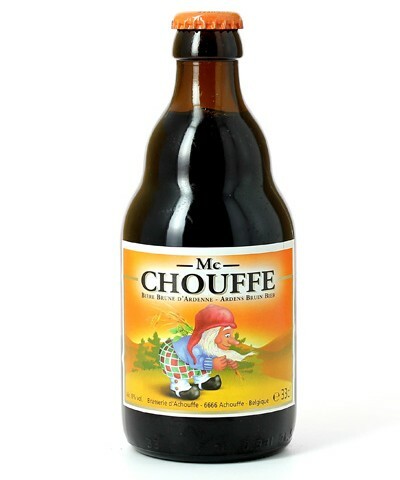 All in all, the Mc Chouffe dark is comparable to most Belgian brown ales I’ve tried, combining a fruity profile that is typically characterized by raisins, plums and dates with notes of sugar, molasses and spices. And of course, it compliments all this with a telltale yeasty flavor and aroma, and of course a strong dose of alcohol. I hope to sample their flagship brew, La Chouffe Blonde, in the near future. As it happens, I know just where to find it! Hello again and good day! It’s the weekend again and I am back with some more new and exciting examples of craft brewing from my local beer store. And today, it’s another visitor from south of the border, Eugene, Oregon to be specific. 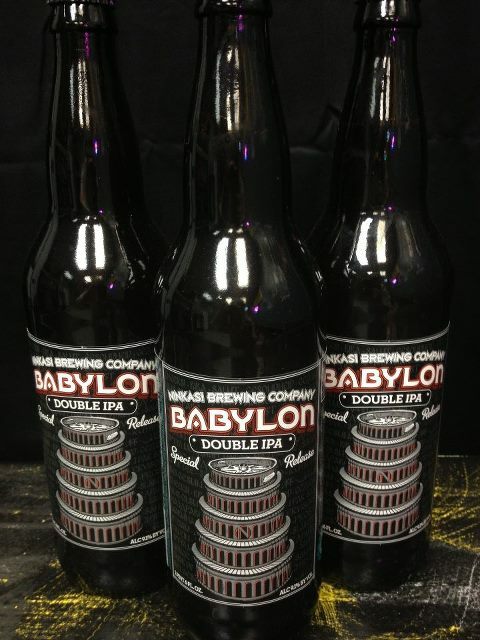 And I’m rather lucky in that my local store has chosen to stock tall boys of Ninkasi’s Babylon Double IPA, a special release beer which is typically available only in their mixer pack. Nothing wrong with those, but if I’m going to sample, I want to sample big! And as the name would suggest, this double IPA is quite the heavy hitter. In addition to some high-gravity malts, it also weighs in at a hefty 9.1% alc/vol. And as could be expected, it also boasts a high concentration of hops, 100 IBUs worth to be exact. As a result, the alcohol, malts, and hops achieve a certain high-concentration balance. Rather than any one aspect of it being overpowering, it’s all overpowering at once! Yes, this beer is not for the faint of heart, uninitiated, or weak of taste of buds! Like anything with the words double and IPA in it, it should only ever be enjoyed by those who have a deep and enduring passion for strong ale and a hefty dose of bitterness! Hoyne’s is back with another seasonal release! And as luck would have it, this one has arrived in time to meet the hot, inclement weather we have been enjoying here in Victoria. So how appropriate is it that the brewery has decided to produce a nice, refreshing lager? But in keeping with Hoyne’s style of brewing, this lager comes with a twist. On the one hand, it has a clean, Munich-style crispness, courtesy of the addition of Noble German Tettnang hops and lagering process. On the other, it has a creamy, smooth profile, courtesy of the darker roasted red malt. And as usual, the style and nature of the beer leads to the double-entendre that is it’s name. 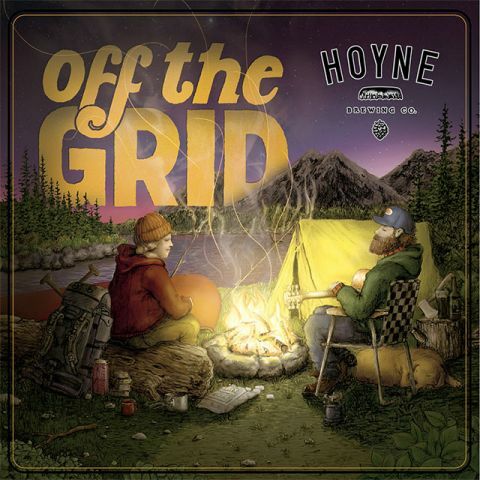 “Off the Grid” not only refers to the summertime activity of getting out into nature and setting up camp off the beaten path, it also honors the decidedly unusual nature of this lager itself. Having endured plenty of hot, sunny days and late evenings, and having now sampled this brew out of both a growler and a bottle, I can attest to this beers refreshing nature and its fine taste. I can also tell you it compliments the change of season quite well. Get yourself to the store, get some bottles, chill and enjoy! Preferably on the patio with some spicy barbeque. Congrats Hoyne, another winner. Hope everyone enjoys the heat! Finally, at long last and after months of stalling, I have managed to procure the the fourth and final beer in the new Moon Under Water lineup. I can remember long ago, back when the brewery underwent a change and released its four newest brews, how I had managed to obtain a bottle of each. But for reasons I prefer to keep to myself, the Weizenbock was lost and did not get its due! Luckily, I managed to get a fresh bottle during my latest visit to one of my favorite beer stores and have sat down to give it a comprehensive tasting and review. And let me tell you, this fourth and final installment in their new lineup may very well be the best of the lot! It’s up against some stiff competition, but after sampling this beer and assessing its characteristics, I have to give it top marks for ingenuity and taste. In short, the label claims its a combination hefeweizen/bock, and when you taste it, that’s exactly what you experience. In addition to dark, rich malts that are smooth, tawny and delicious, you also get a heaping of banana, clove spice, and the yeasty effervescence that wheat beers are famous for. And at 8.2% alc/vol, its also packs a pretty good punch, but concealed within a velvety glove. And as this beer snob will tell you, there’s absolutely nothing wrong with any of that! Known as the Steampunk Dunkelweizenbrau, this new dark wheat is a twist on one of Longwood’s most awesome beers. For years now, I have raved about their regular Dunkelweizen, so when a variation of it appeared at my local beer store sporting a name that is both a tribute to a famous science fiction genre and implying some degree of the steam brewing process, I had to act! And what I found was both consistently awesome with their brewing process and with a nice little twist. Basically, it was much like their Dunkelweizenbrau of yore, being wheaty, yeasty, and boasting some nice roasted coffee malt. However, it also finishes very clean and is profoundly refreshing. Little wonder then why it is one of my favorite beers from this respective brewing operation, and on the island.